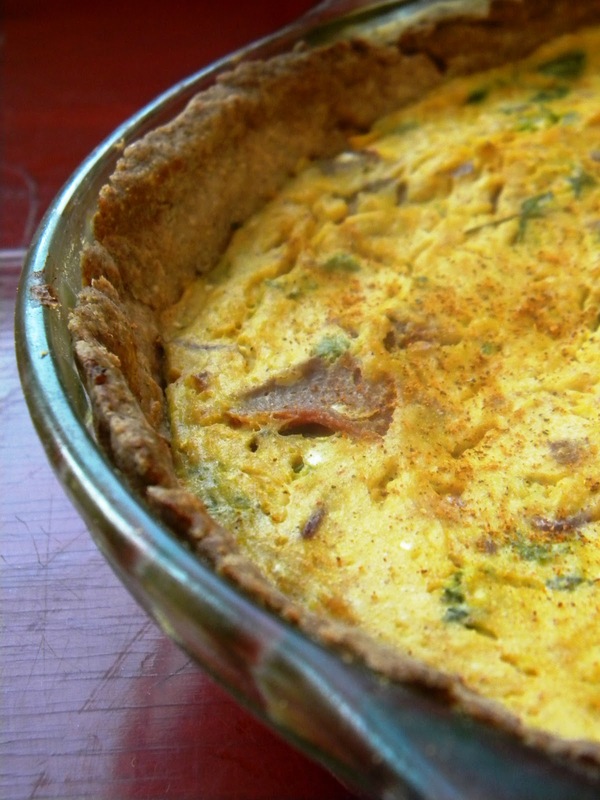 Julia Child learned how to make quiche at Le Cordon Bleu in Paris, France around 1949 and has been credited as creating the best Quiche Lorriane several times over since. When it came time to watch Julie & Julia again to mark the one year anniversary of The Betty Crocker Project creation... well it only seemed to make sense we would also celebrate with one of Julia Child's favorite dishes. Especially since we absentmindedly already made Cobb Salad a few months ago during a salad kick. "Personally, I don’t think pure vegetarianism is a healthy lifestyle. It’s more fear of food—that whole thing that red meat is bad for you. And then there are people who don’t eat meat because it’s against their morals. Well, there’s nothing you can do with people like that. I’ve often wondered to myself: Does a vegetarian look forward to dinner, ever?" But the part of me that wants to see the best in people wants to believe she felt that way because her first exposure to vegetarianism was in the 60s when a cruelty-free lifestyle was labeled a "health food fad" and a weight loss diet. Two things she had little patience for. 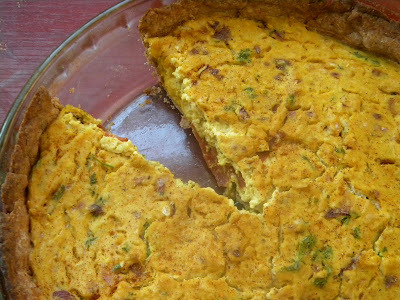 She also never had our Quiche Lorriane with smoked tempeh and Daiya. The world Julia lived in was much different than ours. In just the past 10 years, technology has come far enough that really anything can be made vegan with little to no sacrifice in taste or texture at all. She has been remembered as being a very kind and compassionate person and so I would like to think that although she would probably never go vegan (I mean the woman basically bathed in butter) I would hope she would be intrigued by today's vegans and at least recognize our shared passion for food like so many other of today's top chefs have*. She was a sincere believer in her mantra : "Life itself is the proper binge.” and like I've said before... no one loves food like a vegan. The day I made this, I was full of a thrill and humming Doris Day songs for hours. I won't lie - this is not my first dance around the floor with quiche. I make them a lot and Dan loves them even more than I make them. In fact this quiche was almost completely eaten by my love in a 24 hour period. But this one was special because it combined all the good things about Julia and Betty and maybe some of me too. In a medium bowl, mix Flour and Salt. Cut the Shortening in and then use a pastry blender to mix. You want your Dough to become little clumps that look like small peas. Sprinkle in the Cold Water 1 Tablespoon at a time, and then use a large fork to mix. You just want the dough to be moist but not wet. With your hands, roll the Dough into a ball inside the ball. On a floured surface, roll your Dough ball out with a floured roller. Try to keep the crust even. You don't want some areas to be thinner than others. Gently roll the flattened Dough up into plastic wrap and refrigerate for 45 minutes. You want the Dough to be firm but still pliable so if it is crumbly when you remove it from the fridge. Press the cracks to fix any cracks and then let it warm a little till it is more pliable. In a food processor, blend Tofu, Red Onion, Soy Coffee Creamer, Nutritional Yeast Flakes, Corn Starch, Onion Powder, Cumin, Miso Paste, Tumeric, Braggs and Paprika until you get a smooth paste. Here's where you can taste this blend to see if you want more salt or add some pepper. You can skip this next cooking step if you are using Bac-Os. In your very favorite and much used cast iron skillet, heat around 2 Tablespoons of Olive Oil and a Dash of Liquid Smoke at a medium heat. Then toss in your Vegan Bacon and cook until it is brown and crispy. Then set aside on a paper towel to soak up extra oil. Once they are warm enough to handle with your hands, dice your cooked Vegan Bacon into bits. After your Crust has chilled, unfold into a 9 inch glass pie dish and press it firmly into the dish so that it is even and makes a nice crust. Sprinkle 1/2 your Vegan Bacon Bits, Smoked Sheese into the crust. In a large bowl, mix the Tofu Blend and remaining Bacon Bits, Sheese, Thyme, Parsley and Daiya. Then gently pour it into your Crust. Use a rubber spatula to scrap the side of the bowl and get all the Tofu Blend. Then use it to spread your Tofu Blend evenly into the Crust so that it has a flat surface. Bake your Quiche at 425 for 10 minutes and then reduce heat to 325 and bake another 30 minutes. You'll want to remove your Quiche when the top is golden brown and you can insert a toothpick and remove it cleanly from the center. When you serve, you may want to sprinkle a little extra Paprika over the top... it was lovely. * More about this and Julie Powell tomorrow. This post was already too long. And also, may I just add that I have watched that movie so many times over the past year or so, without even really trying (it's just been on a lot) that I think it's possibly inspired me SUBCONSCIOUSLY even MORE than what it's done for the surface. Spooky. Have you read the book? I'm kinda embarrassed to admit I never finished it. I did read Cleaving - her second book and I have some opinions about it I am sharing tomorrow in Episode II. I agree that movie has a weird way of making you want to whip up some cookies and press some almonds for a glass of milk to go with it! Within the first 24 hours of watching the movie again - I made like 4 dishes and burnt some shortcakes and made some hazelnut biscotti that is tasty but too crumbly to post... I'm still figuring that one out. I don't think Julia would have ever thought about the excitement that vegans can manage to whip up in our kitchens and that's what cooking's all about and something she would have respected. Then again, she didn't like Italian cooking either. She thought it was too easy. Poor Julia doesn't know what she's missing! However, I think I must be missing something too because I baked my quiche for an hour and it was still goopy in the middle. WOW - I'm sorry to hear that. What kind of tofu did you use? I'm thinking maybe it still had a lot of water in it or is a brand that is more soft than the trader joes tofu we usually use. I'd love to help you figure it out. Again sorry it didn't work for you. I would love to try your recipe out. I have made some of you others which have been delicious. I live in Canada and we don't have Trader Joe's here. I'm wondering what firmness of tofu it is. Would you describe it as Medium, firm, or extra firm? Well - we used just that wasn't labeled anything special - just regular tofu - not firm or extra firm but the Trader Joe's regular tofu in my opinion is like firm tofu. I would also try to get as much water out of the tofu as you can! If you make it - send me pictures for the Family Album! We'd love to have them up and hear what you think of the recipe! I ended up making it Sunday for dinner. It turned out pretty good, not quite as firm as I would have liked but delicious. I think I would work on squeezing more water out of the tofu or use extra firm and perhaps use a bit more arrowroot powder. I used almond milk instead of the non-dairy creamer and I made the mistake of adding a bit more because it seemed too dry.